Safety of exercise training in relationship with the risk of hypoglycemia post-bariatric surgery is unknown. To evaluate the safety and magnitude of changes in blood glucose levels during exercise training following bariatric surgery. 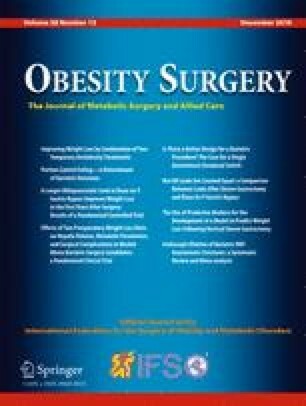 Twenty-nine severely obese patients undergoing either sleeve gastrectomy (SG) (n = 16) or biliopancreatic diversion with duodenal switch (BPD-DS) (n = 13) were prospectively enrolled. Three months after surgery, patients participated in a 12-week supervised exercise training program, (35-min aerobic training with a 25-min resistance exercises) three times a week. Capillary blood glucose (CBG) levels were measured immediately before and after each exercise session. Seven patients (24%) had type 2 diabetes before surgery (mean duration: 10 years); four patients still have type 2 diabetes 3 months post-bariatric surgery. A total of 577 exercise training sessions with CBG monitoring were recorded. Only seven sessions (1.2%) were associated with an episode of asymptomatic hypoglycemia (CBG ≤ 3.9 mmol/L). Patients with type 2 diabetes at baseline showed a larger decrease in CBG with pre-exercise CBG being between 6.1 and 8.0 mmol/L (− 1.6 ± 1.2 vs. − 1.1 ± 0.9 mmol/L, p = 0.02). BPD-DS patients with CBG ≥ 6.1 mmol/L showed higher reduction in CBG following exercise vs. SG patients (− 1.7 ± 1.0 vs. − 1.1 ± 1.1 mmol/L; p < 0.001 and − 4.3 ± 1.0 vs. − 2.2 ± 1.4 mmol/L, p < 0.001, respectively). Three months after bariatric surgery, exercise training program in patients without and with type 2 diabetes is safe, and is associated with a desirable glycemic profile, with few episodes of asymptomatic hypoglycemia.